Kim Keever (born 1955) is an American artist and photographer whose dramatic sceneries are characterized by an imagined and realistic appearance. In creating these setups, he documents places which have never existed or ever will. Fabricated yet natural-looking environments and textures are poised against vivid colors that create visceral reactions. These creations evoke a certain nostalgia and a longing to explore uncharted territories. Using light as a medium, Keever transports his viewers into a sensory and dreamlike realm. His painterly photographs pay homage to the Hudson River School, The Luminist School and photographs of the American west. 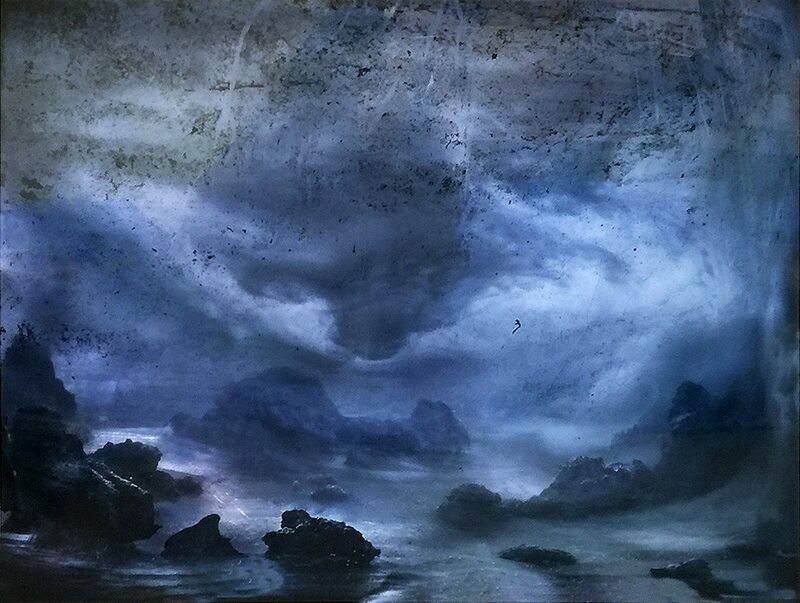 Kim Keever was born in New York City in 1955. After living in an idyllic natural environment with ocean waves, pine trees and glorious sunsets until the age of nine, he moved from the Eastern Shore of Virginia with his mother and sister to the cold streets of Chicago. In the first grade he discovered there was something he could do very well ─ make art. Though he studied art throughout high school, it was not until he was working on a graduate degree in thermal engineering that he realized creating art was the true love of his life. In 1980 he knew that he must be in New York City and has been there ever since. Keever’s signature work was not realized until 1995, when he began utilizing the technique of setup photography. He built landscapes out of plaster, submerging these creations under water, eventually utilizing a 200 gallon glass tank. These panoramic light-filled spaces were fabricated with many materials including multiple colored paints suspended in the water and reflective Mylar. Constructing additions both in front of and behind the tank added an even greater depth to his work. With these methods he created exceptional worlds, which he then photographed and videoed. The diffused glow in the water is the signature of his complex and unconventional creations. In the past two years, he has added to his repertoire of landscape ideas by exploring other subjects inside the tank, including a series of abstractions, an eroding dog, a series of heads and a series of birds. His most recent landscapes reflect his love of the earth and sea, in a beautiful homage to Hawaii. He has exhibited throughout the United States as well as abroad. He lives in New York and works in The East Village. 2009 – Adamson Gallery, Washington, D.C.
1988 – Brody Gallery, Washington, D.C.
1986 – Brody Gallery, Washington, D.C.